The Wisconsin Dairy Products Association has announced the winners of the World Dairy Expo Championship Dairy Products Contest. You can view a list of all the winners here. Having done a fair amount of international travel I always find it interesting to see what people are doing in other countries. Take this story in the Tomah Journal, “Kenyan dairy farmer learns about genetics and embryo tranfer.” It’s a great read about this dairy farmer who’s visiting the United States to learn more. He hopes to visit World Dairy Expo while he’s here! I hope he gets the chance. In the article you can get a little bit of insight into what it’s like to farm in Kenya and what some of their challenges are. Gena Cooper — Wisconsin’s 58th Alice in Dairyland — and Wisconsin Milk Marketing Board (WMMB) will visit Wisconsin schools this year to lead the new Building a Healthy Wisconsin interactive classroom lesson. The session highlights the impact of agriculture to the state and agricultural products’ contribution to a healthy diet. It is a cooperative project of the WMMB and the state Department of Agriculture, Trade & Consumer Protection (DATCP). Lively activities teach that the state’s agriculture industry, especially dairy farming, is vital to both the economic and nutritional health of Wisconsinites. This year’s educational tour will visit fourth grade classrooms in the state’s largest cities; Wausau, Eau Claire, LaCrosse, Green Bay, Racine, Kenosha, Waukesha, Madison, and Milwaukee. Last year’s program Champion Choices from Wisconsin reached 10,000 Wisconsin fourth graders in 246 classrooms. Some interesting new facts and figures came out today from California. California’s dairy business generated $47.4 billion in economic activity within California in 2004 and created 434,200 full-time jobs, according to a study released today by the California Milk Advisory Board (CMAB). The economic study underscores the dynamic growth that the California dairy industry, the largest in the country, has enjoyed in recent years and assesses all aspects of the state’s dairy business, from the production of milk and dairy products to retail and foodservice sales. The study was conducted for the CMAB by J/D/G Consulting Inc., an independent dairy industry research firm based in Florida, and updates a 2002 study that placed the industry’s economic impact on the state at $35.1 billion. “In terms of economic impact, California’s dairy business is one of the largest agriculture forces in the state,” said Stan G. Andre, Chief Executive Officer of the CMAB. “California dairy families are creating jobs and revenues throughout California communities. Based on milk sales within the state, each dollar in farm milk sales generates eight dollars in local economic activity, benefiting a range of Californians — from those growing feed to those working in cheese plants and supermarkets,” Andre said. According to the study, California has 2,107 dairy farms with 1.7 million dairy cows that are supplying milk to 139 dairy plants in the state producing cheese, fluid milk, ice cream, butter and other dairy products. Hello World Dairy Expo fans. We’re in the process of creating a new design for World Dairy Diary. By the end of the weekend we should have it up and running like we want so don’t go away. We hope you’ll like what you see. World Dairy Expo’s Dairy Cattle Exhibitors Committee and Board of Directors have approved a new schedule for the 2005 event to accommodate the growing number of animals exhibited at the world’s premier show. While on the recent International Federation of Agricultural Journalists trip to Switzerland I got to interview Anton Schmutz, the director of Fromarte, the Swiss organization of small cheese manufacturers. Having just returned from the International Federation of Agricultural Journalists Congress (their word for “convention”) I’ve got to say it’s good to be home. While there we saw a number of things that you just don’t see around the United States. Like cow fighting. I’m not talking bull fighting either! Here’s a link to the story on our sister website, AgWired. You can see a short video of the cows fighting which was taken by one of the participants on her mobile phone. I’m still at the International Federation of Agricultural Journalists Congress in Switzerland. The group got to visit a dairy and here’s what we found out. The information is from the IFAJ staff. On the Seeland Excursion people met Peter Gfeller, president of the Swiss dairy farmers union. 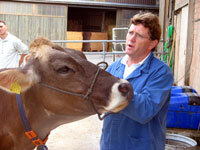 Gfeller is not only an active lobbyist for the milk producers, but also an enthusiastic Brown Swiss cattle breeder. I like and I love my cows, he said. No wonder, taking into account their performances. Emily for example, his favourite cow, is in her 9th lactation with a lifetime milk production of 80 000 Kilos so far. Long living cows are most profitable, emphasized Gfeller. To prepare the calves and heafers for their long and high yielding milk production careers, he sends them to the alp for two successive summers. He is convinced that the temporary live on 1300 Meters over sealevel is good for their lungs and muscle development. Gfeller is not very happy with the plans of the Swiss authorities to leave the quota system between 2006 and 2009. He thinks, Switzerland should not take that step before the competitors in the EU. 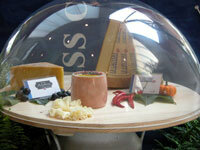 I just couldn’t help post one more picture from the cheese display here at the IFAJ Congress in Thun, Switzerland. They sure make it look pretty don’t they?